Using neural-network technology, Dr. Zhang has built systems that can analyze eye scans for hemorrhages, lesions and other signs of diabetic blindness. Ideally, such systems would serve as a first line of defense, screening patients and pinpointing those who need further attention. Dr. Zhang and his colleagues now have created a system that can diagnose an even wider range of conditions, by recognizing patterns in text, not just in medical images. 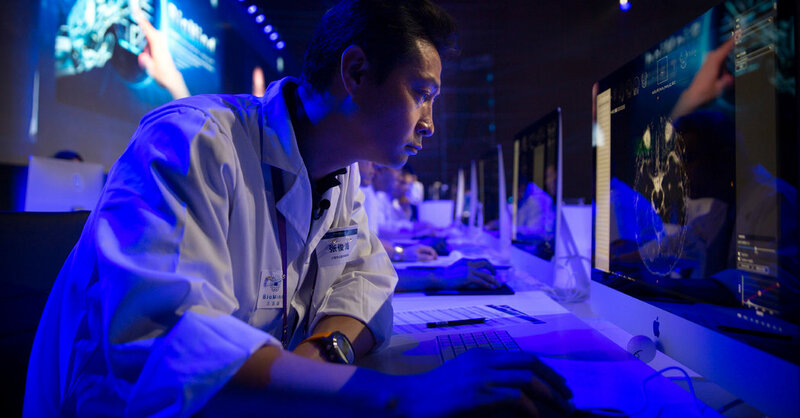 The new system analyzed the electronic medical records of nearly 600,000 patients at the Guangzhou Women and Children’s Medical Center, a hospital in southern China. First, a group of trained physicians annotated the Guangzhou records, adding labels that identified information related to certain medical conditions. The system then analyzed the labeled data. When it was done, and was presented with new data — a patient’s symptoms determined during a physical examination — it was able to make connections on its own. When tested on unlabeled data, the system could rival the performance of experienced physicians. It was more than 90 percent accurate at diagnosing asthma; the accuracy of physicians in the study ranged from 80 to 94 percent. In diagnosing gastrointestinal disease, the system was 87 percent accurate, compared to the physicians’s accuracy of 82 to 90 percent. Experts said extensive clinical trials are now needed, particularly given the difficulty of interpreting decisions made by neural networks.